"Apocryphal" redirects here. For the section found in some Bibles called Apocrypha, see Biblical apocrypha. For The X-Files episode, see Apocrypha (The X-Files). Apocrypha are works, usually written, of unknown authorship or of doubtful origin. Biblical apocrypha is a set of texts included in the Latin Vulgate and Septuagint but not in the Hebrew Bible. While Catholic tradition considers some of these texts to be deuterocanonical, Protestants consider them apocryphal. Thus, Protestant bibles do not include the books within the Old Testament but have often included them in a separate section, usually called the Apocrypha. Other non-canonical apocryphal texts are generally called pseudepigrapha, a term that means "false attribution". The word's origin is the Medieval Latin adjective apocryphus, "secret, or non-canonical", from the Greek adjective ἀπόκρυφος (apokryphos), "obscure", from the verb ἀποκρύπτειν (apokryptein), "to hide away". The term "Apocrypha" commonly appears in Christian religious contexts concerning disagreements about biblical canonicity. Apocryphal writings are a class of documents rejected by some[who?] as being either pseudepigraphical or unworthy to be properly called Scripture, though, as with other writings,[which?] they may sometimes be referenced for support, such as the lost Book of Jasher. While writings that are now accepted by Christians as Scripture were recognized as being such by various believers early on,[when?] the establishment of a largely settled uniform canon was a process of centuries, and what the term "canon" (as well as "apocrypha") precisely meant also saw development. The canonical process took place with believers recognizing writings as being inspired by God from known or accepted origins, subsequently being followed by official affirmation of what had become largely established through the study and debate of the writings. The Catholic Church provided its first dogmatic definition of its entire canon in 1546, which put a stop to doubts and disagreements about the status of the Apocrypha. The leader of the Protestant Reformation, Martin Luther, like the Catholic Church father Jerome (and certain others[who? ]), favored the Masoretic canon for the Old Testament, excluding apocryphal books in his non-binding canon as unworthy to be properly called Scripture, but included most of them in a separate section, as per Jerome. Luther did not include the deuterocanonical books in his Old Testament, terming them "Apocrypha, that are books which are not considered equal to the Holy Scriptures, but are useful and good to read." The Eastern Orthodox Church accepts a few more books[which?] than appear in the Catholic canon. The word "apocryphal" (ἀπόκρυφος) was first applied[by whom?] to writings which were kept secret  because they were the vehicles of esoteric knowledge considered too profound or too sacred to be disclosed to anyone other than the initiated. For example, the disciples of the Gnostic Prodicus boasted that they possessed the secret (ἀπόκρυφα) books of Zoroaster. The term in general enjoyed high consideration among the Gnostics (see Acts of Thomas, pp. 10, 27, 44). Sinologist Anna Seidel refers to texts and even items produced by ancient Chinese sages as apocryphal and studied their uses during Six Dynasties China (A.D. 220 to 589). These artifacts were used as symbols legitimizing and guaranteeing the Emperor's Heavenly Mandate. Examples of these include talismans, charts, writs, tallies, and registers. The first examples were stones, jade pieces, bronze vessels and weapons, but came to include talismans and magic diagrams. From their roots in Zhou era China (1066 to 256 B.C.) these items came to be surpassed in value by texts by the Han dynasty (206 B.C. to A.D. 220). Most of these texts have been destroyed as Emperors, particularly during the Han dynasty, collected these legitimizing objects and proscribed, forbade and burnt nearly all of them to prevent them from falling into the hands of political rivals. It is therefore fitting with the Greek root of the word, as these texts were obviously hidden away to protect the ruling Emperor from challenges to his status as Heaven's choice as sovereign. "Apocrypha" was also applied to writings that were hidden not because of their divinity but because of their questionable value to the church. Many in Protestant traditions cite Revelation 22:18–19 as a potential curse for those who attach any canonical authority to extra-biblical writings such as the Apocrypha. However, a strict explanation of this text would indicate it was meant for only the Book of Revelation. Rv.22:18–19f. (KJV) states: "For I testify unto every man that heareth the words of the prophecy of this book, If any man shall add unto these things, God shall add unto him the plagues that are written in this book: And if any man shall take away from the words of the book of this prophecy, God shall take away his part out of the book of life, and out of the holy city, and from the things which are written in this book." In the context of Revelation, a book predicting the future atrocities of man, it means that God will strip them of the goodness of life ("from the things written in this book") and that they will be removed from heaven ("out of the book of life"). The early Christian theologian Origen, in his Commentaries on Matthew, distinguishes between writings which were read by the churches and apocryphal writings: γραφὴ μὴ φερομένη μέν ἒν τοῖς κοινοῖς καὶ δεδημοσιευμένοις βιβλίοις εἰκὸς δ' ὅτι ἒν ἀποκρύφοις φερομένη (writing not found on the common and published books in one hand, actually found on the secret ones on the other). The meaning of αποκρυφος is here practically equivalent to "excluded from the public use of the church", and prepares the way for an even less favourable use of the word. In general use, the word "apocrypha" came to mean "false, spurious, bad, or heretical." This meaning also appears in Origen's prologue to his commentary on the Song of Songs, of which only the Latin translation survives: De scripturis his, quae appellantur apocriphae, pro eo quod multa in iis corrupta et contra fidem veram inveniuntur a maioribus tradita non placuit iis dari locum nec admitti ad auctoritatem. "Concerning these scriptures, which are called apocryphal, for the reason that many things are found in them corrupt and against the true faith handed down by the elders, it has pleased them that they not be given a place nor be admitted to authority." Other uses of apocrypha developed over the history of Western Christianity. The Gelasian Decree (generally held now as being the work of an anonymous scholar between 519 and 553) refers to religious works by church fathers Eusebius, Tertullian and Clement of Alexandria as apocrypha. Augustine defined the word as meaning simply "obscurity of origin," implying that any book of unknown authorship or questionable authenticity would be considered apocryphal. On the other hand, Jerome (in Protogus Galeatus) declared that all books outside the Hebrew canon were apocryphal. In practice, Jerome treated some books outside the Hebrew canon as if they were canonical, and the Western Church did not accept Jerome's definition of apocrypha, instead retaining the word's prior meaning (see: Deuterocanon). As a result, various church authorities labeled different books as apocrypha, treating them with varying levels of regard. Origen (who stated that "the canonical books, as the Hebrews have handed them down, are twenty-two"), Clement and others cited some apocryphal books as "scripture," "divine scripture," "inspired," and the like. On the other hand, teachers connected with Palestine and familiar with the Hebrew canon excluded from the canon all of the Old Testament not found there. This view is reflected in the canon of Melito of Sardis, and in the prefaces and letters of Jerome. A third view was that the books were not as valuable as the canonical scriptures of the Hebrew collection, but were of value for moral uses, as introductory texts for new converts from paganism, and to be read in congregations. They were referred to as "ecclesiastical" works by Rufinus. These three opinions regarding the apocryphal books prevailed until the Protestant Reformation, when the idea of what constitutes canon became a matter of primary concern for Roman Catholics and Protestants alike. In 1546 the Catholic Council of Trent reconfirmed the canon of Augustine, dating to the second and third centuries, declaring "He is also to be anathema who does not receive these entire books, with all their parts, as they have been accustomed to be read in the Catholic Church, and are found in the ancient editions of the Latin Vulgate, as sacred and canonical." The whole of the books in question, with the exception of 1 Esdras and 2 Esdras and the Prayer of Manasseh, were declared canonical at Trent. The Protestants, in comparison, were diverse in their opinion of the deuterocanon early on. Some considered them divinely inspired, others rejected them. Anglicans took a position between the Catholic Church and the Protestant Churches; they kept them as Christian intertestamental readings and a part of the Bible, but no doctrine should be based on them. John Wycliffe, a 14th-century Christian Humanist, had declared in his biblical translation that "whatever book is in the Old Testament besides these twenty-five shall be set among the apocrypha, that is, without authority or belief." Nevertheless, his translation of the Bible included the apocrypha and the Epistle of the Laodiceans. Martin Luther did not class apocryphal books as being Scripture, but in both the German (1534) translation of the Bible, the apocrypha are published in a separate section from the other books, although the Lutheran and Anglican lists are different. In some editions (like the Westminster), readers were warned that these books were not "to be any otherwise approved or made use of than other human writings." A milder distinction was expressed elsewhere, such as in the "argument" introducing them in the Geneva Bible, and in the Sixth Article of the Church of England, where it is said that "the other books the church doth read for example of life and instruction of manners," though not to establish doctrine. Among some other Protestants, the term apocryphal began to take on extra or altered connotations: not just of dubious authenticity, but having spurious or false content, not just obscure but having hidden or suspect motives. Protestants were (and are) not unanimous in adopting those meanings. The Church of England agreed, and that view continues today throughout the Lutheran Church, the worldwide Anglican Communion, and many other denominations. Whichever implied meaning is intended, Apocrypha was (and is) used primarily by Protestants, in reference to the books of questioned canonicity. Catholics and Orthodox sometimes avoid using the term in contexts where it might be disputatious or be misconstrued as yielding on the point of canonicity. Thus the respect accorded to apocryphal books varied between Protestant denominations. Most Protestant published Bibles that include the apocryphal books will relocate them into a separate section (rather like an appendix), so as not to intermingle them with their canonical books. On the other hand, the Anglican Communion emphatically maintains that the Apocrypha is part of the Bible and is to be read with respect by her members. Two of the hymns used in the American Prayer Book office of Morning Prayer, the Benedictus es and Benedicite, are taken from the Apocrypha. One of the offertory sentences in Holy Communion comes from an apocryphal book (Tob. 4: 8–9). Lessons from the Apocrypha are regularly appointed to be read in the daily, Sunday, and special services of Morning and Evening Prayer. There are altogether 111 such lessons in the latest revised American Prayer Book Lectionary [The books used are: II Esdras, Tobit, Wisdom, Ecclesiasticus, Baruch, Three Holy Children, and I Maccabees.] The position of the Church is best summarized in the words of Article Six of the Thirty-nine Articles: "In the name of Holy Scripture we do understand those canonical Books of the Old and New Testament, of whose authority there was never any doubt in the Church... And the other Books (as Hierome [St. Jerome] saith) the Church doth read for example of life and instruction of manners; but yet doth it not apply them to establish any doctrine. With few exceptions, the 66-book Protestant canon (such as listed in the Westminster Confession of 1646) has been well established for centuries, and with many today contending against the Apocrypha using various arguments. The adjective apocryphal is commonly used in modern English to refer to any text or story considered to be of dubious veracity or authority, although it may contain some moral truth. In this broader metaphorical sense, the word suggests a claim that is in the nature of folklore, factoid or urban legend. Although Orthodox Jews believe in the exclusive canonization of the current 24 books in the Tanakh, they also consider the Oral Torah to be authoritative, which they believe was handed down from Moses. The Sadducees—unlike the Pharisees but like the Samaritans—seem to have maintained an earlier and smaller number of texts as canonical, preferring to hold to only what was written in the Law of Moses (making most of the presently accepted canon, both Jewish and Christian, apocryphal in their eyes). Certain circles in Judaism, such as the Essenes in Judea and the Therapeutae in Egypt, were said to have a secret literature (see Dead Sea scrolls). Other traditions maintained different customs regarding canonicity. The Ethiopic Jews, for instance, seem to have retained a spread of canonical texts similar to the Ethiopian Orthodox Christians, cf Encyclopaedia Judaica, Vol 6, p 1147. During the birth of Christianity many Jewish texts of Hellenistic origin existed within Judaism and were frequently used by Christians. Catholic Christians incorporated several of these books into the canon of the Christian Bible, calling them the "apocrypha" or the "hidden books" of the Bible. Patristic authorities frequently recognized these books as important to the emergence of apostolic Christianity, but the inspired authority and value of the apocrypha remained widely disputed. In the sixteenth century, during the Protestant reformation, some authorities began using term deuterocanonical to refer to this traditional intertestamental collection as books of "the second canon." These books are often seen as "intertestamental" because reading them helps explain the theological and cultural transitions which took place between the Old and New Testaments. They are also sometimes called "intertestamental" by religious groups who do not recognize Hellenistic Judaism as belonging with either "Jewish" or "Christian" testaments. Slightly varying collections of apocryphal, deuterocanonical, or intertestamental books of the Bible form part of the Roman Catholic, Eastern Orthodox and Oriental Orthodox canons (cf Development of the Old Testament canon). The deuterocanonical or intertestamental books of the Catholic Church include 1-2 Esdras, Tobit, Judith, Additions to Esther, the Wisdom of Solomon, Ecclesiasticus, Baruch, the Letter of Jeremiah, the Prayer of Azariah, Susanna, Bel and the Dragon, the Prayer of Manasseh, and 1-2 Maccabees. The Book of Enoch is included in the biblical canon of the Oriental Orthodox churches of Ethiopia and Eritrea. The Epistle of Jude quotes the book of Enoch, and some believe the use of this book also appears in the four gospels and 1 Peter. The genuineness and inspiration of Enoch were believed in by the writer of the Epistle of Barnabas, Irenaeus, Tertullian and Clement of Alexandria and much of the early church. The epistles of Paul and the gospels also show influences from the Book of Jubilees, which is part of the Ethiopian canon, as well as the Assumption of Moses and the Testaments of the Twelve Patriarchs, which are included in no biblical canon. The canonical validity of the intertestamental books was challenged in the 16th century by Protestants. The Protestant removal of the deuterocanonical books of the Bible did not happen immediately as part of the Reformation, but rather happened in waves over time. The apocryphal books were in fact translated as part of the King James Version of the Bible. Eventually they were effectively removed by Protestants during the 1800s, with some Protestants arguing against their inclusion for theological reasons, and with other Protestants citing the cost of publishing the hidden books as a major factor in removing them. Today it is possible to find Protestant Bibles which now include the Apocrypha. The status of the deuterocanonicals remains unchanged in Catholic and Orthodox Christianities. The actual status of the books which the Catholic church terms Deuterocanonicals (second canon) and Protestantism refers to as Apocrypha has been an issue of disagreement which preceded the Reformation. Many believe that the pre-Christian-era Jewish translation (into Greek) of holy scriptures known as the Septuagint, a Greek translation of the Hebrew Scriptures originally compiled around 280 B.C., originally included the apocryphal writings in dispute, with little distinction made between them and the rest of the Old Testament. Others argue that the Septuagint of the first century did not contain these books but were added later by Christians, The earliest extant manuscripts of the Septuagint are from the fourth century, and suffer greatly from a lack of uniformity as regards containing apocryphal books, and some also contain books classed as Pseudepigrapha, from which texts were cited by some early writers in the second and later centuries as being Scripture. While a few scholars conclude that the Jewish canon was the achievement of the Hasmonean dynasty, it is generally considered not to have been finalized until about 100 A.D. or somewhat later, at which time considerations of Greek language and beginnings of Christian acceptance of the Septuagint weighed against some of the texts. Some were not accepted by the Jews as part of the Hebrew Bible canon and the Apocrypha is not part of the historical Jewish canon. "In the Latin Church, all through the Middle Ages [5th century to the 15th century] we find evidence of hesitation about the character of the deuterocanonicals. There is a current friendly to them, another one distinctly unfavourable to their authority and sacredness, while wavering between the two are a number of writers whose veneration for these books is tempered by some perplexity as to their exact standing, and among those we note St. Thomas Aquinas. Few are found to unequivocally acknowledge their canonicity." The prevailing attitude of Western medieval authors is substantially that of the Greek Fathers. The wider Christian canon accepted by Augustine became the more established canon in the western Church after being promulgated for use in the Easter Letter of Athanasius (circa 372 A.D.), the Synod of Rome (382 A.D., but its Decretum Gelasianum is generally considered to be a much later addition ) and the local councils of Carthage and Hippo in north Africa (391 and 393 A.D). Athanasius called canonical all books of the Hebrew Bible including Baruch, while excluding Esther. He adds that "there are certain books which the Fathers had appointed to be read to catechumens for edification and instruction; these are the Wisdom of Solomon, the Wisdom of Sirach (Ecclesiasticus), Esther, Judith, Tobias, the Didache, or Doctrine of the Apostles, and the Shepherd of Hermas. All others are apocrypha and the inventions of heretics (Festal Epistle for 367)". Nevertheless, none of these constituted indisputable definitions, and significant scholarly doubts and disagreements about the nature of the Apocrypha continued for centuries and even into Trent, which provided the first infallible definition of the Catholic canon in 1546. This canon came to see appropriately 1,000 years of nearly uniform use by the majority, even after the 11th-century schism that separated the church into the branches known as the Roman Catholic and Eastern Orthodox churches. In the 16th century, the Protestant reformers challenged the canonicity of the books and partial-books found in the surviving Septuagint but not in the Masoretic Text. In response to this challenge, after the death of Martin Luther (February 8, 1546) the ecumenical Council of Trent officially ("infallibly") declared these books (called "deuterocanonical" by Catholics) to be part of the canon in April, 1546 A.D. 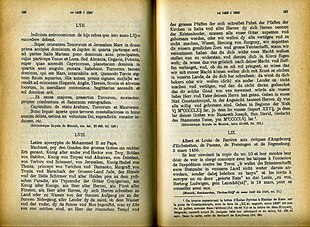 While the Protestant Reformers rejected the parts of the canon that were not part of the Hebrew Bible, they included the four New Testament books Luther held as doubtful canonicity along with the Apocrypha in his non-binding canon (though most were separately included in his bible, as they were in some editions of the KJV bible until 1947). Protestantism therefore established a 66 book canon with the 39 books based on the ancient Hebrew canon, along with the traditional 27 books of the New Testament. Protestants also rejected the Catholic term "deuterocanonical" for these writings, preferring to apply the term "apocryphal" which was already in use for other early and disputed writings. As today (but along with others reasons), various reformers argued that those books contained doctrinal or other errors and thus should not have been added to the canon for that reason. The differences between canons can be seen under Biblical canon and Development of the Christian biblical canon. Explaining the Eastern Orthodox Church's canon is made difficult because of differences of perspective with the Roman Catholic church in the interpretation of how it was done. Those differences (in matters of jurisdictional authority) were contributing factors in the separation of the Roman Catholics and Orthodox around 1054, but the formation of the canon which Trent would later officially definitively settle was largely complete by the fifth century, in not settled, six centuries before the separation. In the eastern part of the church, it took much of the fifth century also to come to agreement, but in the end it was accomplished. The canonical books thus established by the undivided church became the predominate canon for what was later to become Roman Catholic and Eastern Orthodox alike. The East did already differ from the West in not considering every question of canon yet settled, and it subsequently adopted a few more books into its Old Testament. It also allowed consideration of yet a few more to continue not fully decided, which led in some cases to adoption in one or more jurisdictions, but not all. Thus, there are today a few remaining differences of canon among Orthodox, and all Orthodox accept a few more books than appear in the Catholic canon. The Psalms of Solomon, 3 Maccabees, 4 Maccabees, the Epistle of Jeremiah the Book of Odes, the Prayer of Manasseh and Psalm 151 are included in some copies of the Septuagint, some of which are accepted as canonical by Eastern Orthodox and some other churches. Protestants accept none of these additional books as canon either, but see them having roughly the same status as the other Apocrypha. New Testament apocrypha—books similar to those in the New Testament but almost universally rejected by Catholics, Orthodox and Protestants—include several gospels and lives of apostles. Some were written by early Jewish Christians (see the Gospel according to the Hebrews). Others of these were produced by Gnostic authors or members of other groups later defined as heterodox. Many texts believed lost for centuries were unearthed in the 19th and 20th centuries, producing lively speculation about their importance in early Christianity among religious scholars, while many others survive only in the form of quotations from them in other writings; for some, no more than the title is known. Artists and theologians have drawn upon the New Testament apocrypha for such matters as the names of Dismas and Gestas and details about the Three Wise Men. The first explicit mention of the perpetual virginity of Mary is found in the pseudepigraphical Infancy Gospel of James. Before the fifth century, the Christian writings that were then under discussion for inclusion in the canon but had not yet been accepted were classified in a group known as the ancient antilegomenae. These were all candidates for the New Testament and included several books which were eventually accepted, such as: The Epistle to the Hebrews, 2 Peter, 3 John and the Revelation of John (Apocalypse). None of those accepted books can be considered Apocryphal now, since all Christendom accepts them as canonical. Of the uncanonized ones, the Early Church considered some heretical but viewed others quite well. Some Christians, in an extension of the meaning, might also consider the non-heretical books to be "apocryphal" along the manner of Martin Luther: not canon, but useful to read. This category includes books such as the Epistle of Barnabas, the Didache, and The Shepherd of Hermas which are sometimes referred to as the Apostolic Fathers. The Gnostic tradition was a prolific source of apocryphal gospels. While these writings borrowed the characteristic poetic features of apocalyptic literature from Judaism, Gnostic sects largely insisted on allegorical interpretations based on a secret apostolic tradition. With them, these apocryphal books were highly esteemed. A well-known Gnostic apocryphal book is the Gospel of Thomas, the only complete text of which was found in the Egyptian town of Nag Hammadi in 1945. The Gospel of Judas, a Gnostic gospel, also received much media attention when it was reconstructed in 2006. Roman Catholics and Orthodox Christians as well as Protestants generally agree on the canon of the New Testament, see Development of the New Testament canon. The Ethiopian Orthodox have in the past also included I & II Clement and Shepherd of Hermas in their New Testament canon. Prophetic texts called the Ch'an-wei (zh:讖緯) were written by Han Dynasty (206 BCE to 220 CE) Taoist priests to legitimize as well as curb imperial power. They deal with treasure objects that were part of the Zhou (1066 to 256 BCE) royal treasures. Emerging from the instability of the Warring States period (476–221 BCE), ancient Chinese scholars saw the centralized rule of the Zhou as an ideal model for the new Han empire to emulate. The Ch'an-wei are therefore texts written by Han scholars about the Zhou royal treasures, only they were not written to record history for its own sake, but for legitimizing the current imperial reign. These texts took the form of stories about texts and objects being conferred upon the Emperors by Heaven and comprising these ancient sage-king's (this is how the Zhou emperors were referred to by this time, about 500 years after their peak) royal regalia. The desired effect was to confirm the Han emperor's Heavenly Mandate through the continuity offered by his possession of these same sacred talismans. It is because of this politicized recording of their history that it is difficult to retrace the exact origins of these objects. What is known is that these texts were most likely produced by a class of literati called the fangshi. These were a class of nobles who were not part of the state administration; they were considered specialists or occultists, for example diviners, astrologers, alchemists or healers. It is from this class of nobles that the first Taoist priests are believed to have emerged. Seidel points out however that the scarcity of sources relating to the formation of early Taoism make the exact link between the apocryphal texts and the Taoist beliefs unclear. Apocryphal Jatakas of the Pali Buddhist canon, such as those belonging to the Paññāsajātaka collection, have been adapted to fit local culture in certain Southeast Asian countries and have been retold with amendments to the plots to better reflect Buddhist morals. Within the Pali tradition, the apocryphal Jatakas of later composition (some dated even to the 19th century) are treated as a separate category of literature from the "Official" Jataka stories that have been more-or-less formally canonized from at least the 5th century—as attested to in ample epigraphic and archaeological evidence, such as extant illustrations in bas relief from ancient temple walls. ^ Little, Williams. Onions, C.T., editors (1955). The Oxford Universal Dictionary. Oxford University Press. ^ a b Bromiley, Geoffrey William, ed. (2009). "Apocrypha". The International Standard Bible Encyclopedia (2 ed.). Grand Rapids, Michigan: W.B. Eerdmans. ^ "Apocrypha - Definition". merriam-webster.com. ^ a b c d McDonald, Lee Martin (2009). Forgotten Scriptures: The Selection and Rejection of Early Religious Writings. Louisville, KY 40202-1396: Westminster John Knox Press. pp. 11–33. ISBN 978-0664233570. Retrieved 24 November 2015. ^ New Catholic Encyclopedia. 3. , Washington, DC 20064: Catholic University of America. 2003. pp. 20, 26. ^ Coogan, Michael David (2007). The New Oxford Annotated Bible with the Apocryphal/Deuterocanonical Books . Oxford, United Kingdom: Oxford University Press. p. 457. ^ Willett, Herbert Lockwood (21 April 2018). "The Popular and Critical Bible Encyclopædia and Scriptural Dictionary: Fully Defining and Explaining All Religious Terms, Including Biographical, Geographical, Historical, Archæological and Doctrinal Themes, Superbly Illustrated with Over 600 Maps and Engravings". Howard-Severance Company. Retrieved 21 April 2018 – via Google Books. ^ Hastings, James (2014). A Dictionary of the Bible: Volume I (Part I: A -- Cyrus). The Minerva Group, Inc. p. 116. ISBN 9781410217226. ^ a b Seidel, Anna. "Imperial treasures and Taoist sacraments", in M. Strickmann, ed., Tantric and Taoist Studies in Honor of Rolf A. Stein, II, Bruxelles, Institut belge des hautes etudes chinoises. pp. 291-371. ^ "Origen on the Canon". BibleResearcher.com. Retrieved 29 November 2015. ^ "John Wycliffe's Translation". nnu.edu. ^ "THE WESTMINSTER CONFESSION OF FAITH". BibleResearcher.com. Retrieved 29 November 2015. ^ Blocher, Henri (2004). "Helpful or Harmful? The "Apocrypha" and Evangelical Theology". European Journal of Theology (13.2): 81–90. ^ Webster, William. "The Old Testament Canon and the Apocrypha Part 3". Retrieved 29 November 2015. ^ Shamoun, Sam. "Are The Jewish Apocrypha Inspired Scripture? Pt. 4". Answering Islam - A Christian-Muslim dialog. Answering Islam. Retrieved 29 November 2015. ^ The Style Manual for the Society of Biblical Literature recommends the use of the term deuterocanonical literature instead of apocrypha in academic writing, although not all apocryphal books are properly deuterocanonical. ^ Software, Accordance Bible. "New Release: Comprehensive Bible Cross References". Accordance Bible Software. Retrieved 21 April 2018. ^ a b c Wegner, Paul D. (2004). The Journey from Texts to Translations: The Origin and Development of the Bible. Baker Academic. p. 14. ISBN 978-0801027994. ^ Beckwith, Roger T. (November 1, 2008). The Canon of the Old Testament (PDF). Eugene, OR: Wipf & Stock Pub. pp. 62, 382–83. ISBN 978-1606082492. Retrieved 23 November 2015. ^ Ellis, E. E. (1992). The Old Testament in Early Christianity. Ada, MI 49301: Baker. pp. 34–35. ^ Archer, Jr, Gleason (2007). A survey of Old Testament introduction ([Rev. and expanded]. ed.). Chicago, IL: Moody Press. pp. 75–86. ISBN 978-0802484345. ^ Biddle, Martin Hengel with the assistance of Roland Deines; introd. by Robert Hanhart; transl. by Mark E. (2004). The Septuagint as Christian Scripture : its prehistory and the problem of its canon (North American paperback ed.). Grand Rapids: Baker Academic. pp. 57–59. ISBN 080102790X. ^ Davies, Philip R. (September 1, 2013). Rethinking Biblical Scholarship: Changing Perspectives 4. Routledge. p. 225. ISBN 978-1844657278. ^ Newman, Robert C. "THE COUNCIL OF JAMNIA AND THE OLD TESTAMENT CANON" (PDF). Gordon Faculty Online. Gordon College. Retrieved 23 November 2015. ^ "Correspondence of Augustine and Jerome concerning the Latin Translation of the Scriptures". bible-researcher.com. ^ Knight, Kevin. ". Canon of the Old Testament". New Advent. The Catholic Encyclopedia. Retrieved 26 November 2015. ^ Lienhard, S.J. A.B., Joseph. The Bible, the Church, and Authority. Collegeville, Minnesota: Fordham University. p. 59. ^ BURKITT, F. C. "THE DECRETUM GELASIANUM". tertullian.org. Retrieved 26 November 2015. ^ bible-researcher.com. "Athanasius on the Canon". Retrieved 26 November 2015. ^ Jedin, Hubert (1947). Papal Legate At The Council Of Trent. St Louis: B. Herder Book Co. pp. 270–271. ^ Wicks, Jared (1978). Cajetan Responds: A Reader in Reformation Controversy. Washington: The Catholic University Press of America. ^ Metzger, Bruce (1957). An Introduction to the Apocrypha. New York: Oxford. p. 180. ^ Catholic Encyclopedia (1908). Canon of the Old Testament. New York: Robert Appleton Company. ^ H. Tavard,, George (1959). Holy Writ or Holy Church. London: Burns & Oates. pp. 16–17. ^ Hiers, Richard H. (October 1, 2001). The Trinity Guide to the Bible. Norcross, GA 3007: Trinity Press International. p. 148. ISBN 1563383403. Retrieved 23 November 2015. ^ "The Old Testament Canon and Apocrypha". BibleResearcher. Retrieved 27 November 2015. ^ a b c d Seidel, Anna. "Imperial treasures and Taoist sacraments", in M. Strickmann, ed., Tantric and Taoist Studies in Honor of Rolf A. Stein, II, Bruxelles, Institut belge des hautes etudes chinoises. 291–371. ^ (Phra), Hōrāthibō̜dī; Siam), Nārāi (King of; Prince Paramānuchit Chinōrot (Son Of Phutthayō̜Tfā Čhulālōk, King of Siam (1993). The Tale of Prince Samuttakote. ISBN 9780896801745. ^ Sengpan Pannyawamsa (2007). "The Tham Vessantara-jAtaka: A Critical Study of the Tham Vessantara-jAtaka and its Influence on Kengtung Buddhism, Eastern Shan State, Burma." PhD Thesis. This article incorporates text from a publication now in the public domain: Charles, Robert Henry (1911). "Apocryphal Literature" . In Chisholm, Hugh (ed.). Encyclopædia Britannica. 2 (11th ed.). Cambridge University Press. pp. 175–183. Look up apocrypha in Wiktionary, the free dictionary. Wikimedia Commons has media related to Deuterocanonical books. The Apocrypha is in the religion section at the e.Lib. LDS Bible Dictionary - Apocrypha – Definition & LDS POV, including brief book descriptions. Aldenicum The Trilogy, an apocryphal view on life and reality around us. Schem, A. J. (1879). "Apocrypha" . The American Cyclopædia. "Apocrypha" . New International Encyclopedia. 1905. EarlyChristianWritings.com A chronological list of early Christian books and letters, both complete and incomplete works; canonical, apocryphal and Gnostic. Many with links to English translations.